Every season has a tipping point, that moment when things start to flow toward a positive outcome or another bitter disappointment. Most of the time, it’s only evident in hindsight; these kinds of things are typically easiest to spot in the rearview mirror. But on rare occasions, that instant is apparent in real time; it’s painfully obvious as it’s happening. This weekend at Coors Field, the ever-elusive tipping point was occurring before everyone’s eyes. As the Rockies took on the Marlins in a three-game set, the Continental Divide of the 2016 season became crystal clear. And it didn’t lean in the right direction for Colorado. Coming into the series, the Rockies had clawed their way back into contention. They sat at a dead-even 54-54 and were just three games back of Miami for the final wild card spot in the National League. 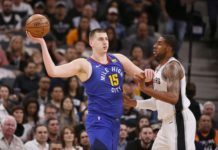 It set up a weekend slate that had the potential of seeing Colorado make the race closer, adding even more intrigue to the coming days and weeks of the season. Unfortunately, that’s not how things unfolded. Instead, the Rockies dropped two out of three, falling four games back of the Marlins in the wild card chase. While that’s not an insurmountable mountain to climb given that it’s still early August, the way in which Colorado squandered a golden opportunity doesn’t bode well for the remainder of the season. In the first game of the series, the Rockies rallied for three runs in the eighth inning, giving them a 3-1 lead heading into the ninth. But then, as has so often been in the case with the franchise, Colorado’s bullpen gave it all back – and then some – with the game on the line. This time around, for the fourth time this season, it was Carlos Estevez blowing the leading, surrendering four runs on three hits and two walks in the final inning. That one inning caused a two-game swing in the standings. Instead of being two behind in the chase for the playoffs, the Rockies were suddenly in a four-game hole. That stings. They bounced back on Saturday night, posting a 12-6 win to even the series at one game apiece and setting up a vital rubber match. With a victory on Sunday, Colorado could salvage the series and gain vital ground on Miami. 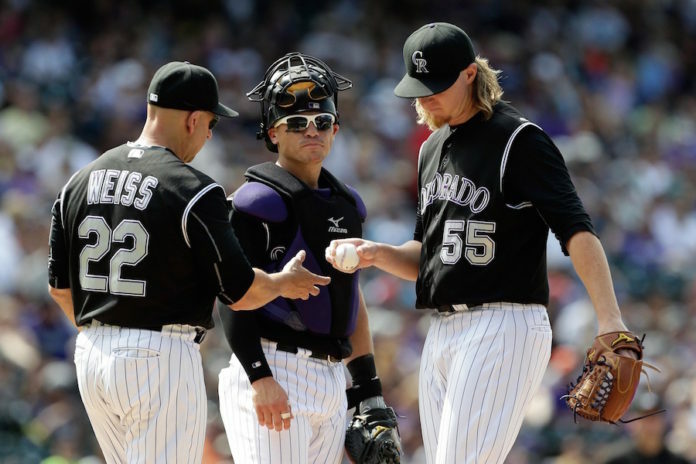 On paper, the big game set up well; after all, the Rockies had their ace – Jon Gray – on the mound. But when the lineup card was submitted, optimism suddenly turned into disappointment; for some reason, Walt Weiss had decided to use the final game against the Marlins as a rest day for a couple of key players. After batting .300 in the first two games of the series, Carlos Gonzalez was given the day off; instead of having the All-Star rightfielder in the lineup, Colorado would trot out a player fresh off the Disabled List – Gerardo Parra – for the key game. Not surprisingly, Parra struggled, both at the plate and in the field, continuing a season-long trend for the veteran. And after a night in which he went 2-for-5 at the plate, Daniel Descalso was also out of the lineup. Instead of having the scrappy hitting shortstop in the lineup in place of the injured Trevor Story, the Rockies instead went with Cristhian Adames in the middle of their infield; he’s still struggling to reach the Mendoza Line this season. Not surprisingly, the day didn’t go well for Colorado. Yes, they got enough offense to win, even without two of their better bats in the lineup, but Gray struggled on the hill, giving up eight runs in less than four innings of work. In the end, the Rockies couldn’t dig out of an 8-1 hole, falling 10-7 in the series finale. As a result, the Marlins headed out of town with a four-game lead over Colorado. What’s frustrating is the fact that they should have escaped Denver with a two-game cushion at best, perhaps even knotted up in the standings. Friday night’s game was imminently winnable for the Rockies; they had a two-run lead heading into the ninth. And yesterday’s matchup was also there for the taking; they simply didn’t take the right approach. The first setback is something that can be stomached; while no one likes to see a pitcher blow a game, at least it wasn’t a controllable blunder. But Sunday’s loss was more frustrating, as it was set in motion by mistakes that were clearly avoidable. While there are still 51 games to be played this season, the finale against the Marlins had a must-win feel to it. Colorado had the chance to win the three-game set, close the gap in the standings and continue their streak of consecutive series wins. As a result, they needed to be all in. It felt like a tipping point of the season. Instead, they treated the game like they have so many Sunday afternoon games in recent years, running out a junior varsity lineup in order to give some players a day off. It was the wrong move at the wrong time, sending an unbelievably bad message; it’s not surprising that Colorado came out of the gates slowly against the Marlins, as management had decided it was a day of rest at Coors Field. This wasn’t the time for a day off. This was the time for a sense of urgency. This was the time to show that every game matters. This was the time to let everyone know that the Rockies are going to make a push down the stretch. That’s what made Sunday so disappointing. It served as just another example of how Colorado doesn’t seem to be all in. At some point, they need to push their chips to the center of the table. Get a much-needed series win against a team higher up the standings. Put a star player with a gimpy ankle in the lineup for a big game. Show that winning is important. Instead, Colorado played it safe, letting players with bumps and bruises enjoy a breather. And in the process, they watched as their 2016 season tilted in the wrong direction.